On warm summer days a pot of fresh ginger root tea always goes down well. Made with added cinnamon and mint leaves (peppermint or spearmint), not only is this drink refreshing and tasty, but like all spiced and herbal teas, very healthy! For one with added nutmeg and orange juice, here is another ginger tea recipe, and if you would prefer a version with just the root on its own you will probably enjoy this basic, simple recipe. Note: You can pour through a tea strainer first or, just remove the cinnamon sticks and drink with the ginger and mint leaves still in! If you enjoyed making this ginger root tea and would like to make more spice and herbal teas, then have a look at my new book full of healthy recipes anyone can make. Of all the spices and herbs, ginger is a superstar when it comes to health and well-being benefits. 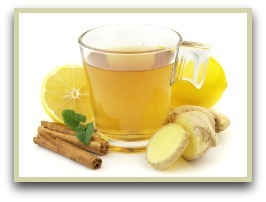 This tea, particularly if you add honey and lemon, can help relieve flu and cold symptoms. It's also a traditional remedy for heartburn and upset stomachs. And for a long time, Far Eastern fishermen and sailors have used it as a preventative measure against sea sickness. Click here to read more on the ginger health benefits. More Homemade Tea Recipes You May Enjoy!